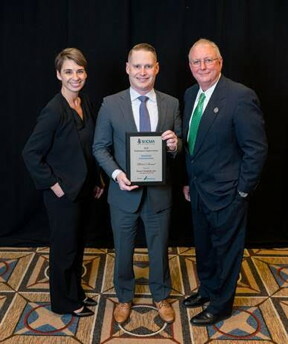 Strem Chemicals, Inc., is pleased to announce it has been recognized for outstanding efforts in improving environmental, health, safety and security (EHS&S) at its Newburyport, MA, facility by the Society of Chemical Manufacturers & Affiliates (SOCMA), the leading trade association representing specialty chemical manufacturers. Strem participates in ChemStewards®, SOCMA’s nationally recognized EHS&S program that promotes safety and environmental compliance to all stakeholders. Strem accepted the Silver Performance Improvement Award at SOCMA’s 97th Annual Dinner & Meeting on December 10 in New York City. This is the 7th year Strem has received the award. R.J. Wolcik, Environmental, Health and Safety Specialist, accepted the award on behalf of the company at the awards dinner. Copyright © Strem Chemicals, Inc.